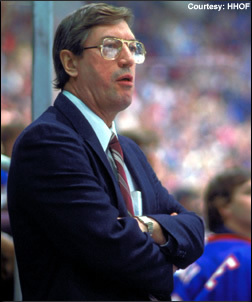 Al Arbour, who coached the New York Islanders to four consecutive Stanley Cups in the early 1980s, will step behind the bench again this Saturday to coach his 1,500th NHL game. Al Arbour’s routine has changed quite a bit in his golden years. No longer does the Hall of Fame coach stay up late at night wondering about line combinations or defensive pairings. He isn’t concerned with starting Chico Resch or Billy Smith. He never has to worry about traffic on the Long Island Expressway. These days, the former New York Islanders’ legendary coach watches a period, maybe a period and a half of hockey via Direct TV from his home in western Florida before his eyes close for the night. Come Saturday night, all of that changes. Come Saturday night, Arbour will be behind the Islanders bench one more time. As a result of a generous idea brought forward by current Islanders coach Ted Nolan, Arbour will return to the Nassau Veterans Memorial Coliseum to coach the Islanders against Sidney Crosby and the Pittsburgh Penguins. It’ll be Arbour’s 1,500th game behind the Islanders bench, a nice round number that Nolan felt he deserved. Nolan said he conceived the idea in his mind through the course of last season when every day he would walk past a board plastered with all of the Islanders' records and achievements, and see the number 1,499 next to Arbour’s name. So Nolan got the approval from General Manager Garth Snow and team owner Charles Wang, and Arbour happily accepted the invite in mid-July. So Arbour and his famous glasses will return Saturday night, but since he doesn’t watch all that much hockey anymore he’s spent the last week and a half getting himself acclimated with the Islanders and Penguins. Nolan said they sent game notes and game films to Arbour at his home just outside of Sarasota, Fla. last week. Arbour is expected at Islanders practice Friday, and the morning skate on Saturday morning. He’s still not sure what his duties will be on game night. “If I’m in charge, they’re in trouble,” Arbour said. Not so, according to Nolan, who plans to stand next to Arbour on the bench and utilize this incredible resource of hockey knowledge. Arbour, a 1996 inductee into the Hockey Hall of Fame, is second only to Scotty Bowman in career wins with 781. He compiled a 739-537-223 regular season record with the Islanders and led them to four straight Stanley Cup championships from 1980-83. The Islanders 19 straight playoff series victories are still an NHL record. Arbour also has his name etched on the Stanley Cup in four different places as a player as he won the trophy in 1954 with the Red Wings, in 1961 with the Blackhawks, and twice, 1962 and 1963, with the Maple Leafs. Arbour, a popular figure on Long Island, was adored by his players. Arbour actually doesn’t care how much say he has in the game. He’s just happy to be able to stand behind the bench. It wasn’t long ago that Arbour was relegated to wheelchair duty thanks to operation after operation on his left knee. It was in June of 2003, right before he and Claire, his wife, were to make their annual summer sojourn to their cottage in Sudbury, Ont. that Arbour’s knee blew up like a balloon. He had an infection and doctors told him he had five days to remove the knee. He returned to Sarasota and had the operation. Doctors cleaned the knee and put it back in five months later. Arbour, though, began bleeding profusely out of that same knee only months later and it had to be removed again. This happened “quite a few times,” Arbour said, unable to recall exactly how many surgeries he had on this knee. He was in a wheelchair for roughly two years before finally walking again in 2005. He can coach, and although Arbour has so far downplayed his role in Saturday’s game, one of his former players knows the coach has been preparing. 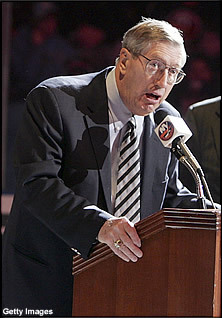 “Al Arbour is getting ready now,” Denis Potvin, the former Islander great and Hockey Hall of Famer, said last week. “There was never a game he wasn’t ready. Arbour was the prototypical players coach. The guys loved playing for him, and Resch, a former Islanders’ goalie, said Arbour would be in tears when he had to trade one of his boys away. “He was a father figure after your first year there,” said Resch, who was dealt from Long Island to the Colorado Rockies (now the New Jersey Devils) during the 1980-81 season. Arbour, though, doesn’t believe his style would gel with today’s NHL. “We’ll just have to make his afternoon nap a little bit longer,” Nolan quipped.